First on Friday we had a series of lectures here listed in order of appearance were. Lt. General Russell J. Handy who is commander of Alaskan Command he spoke on. " The Cold War Today "
Col. Joe Griffith (USAF Retired) he spoke on.	" The Cold War from an Alaskan and Pentagon Perspective "
Brig. General Leon M. "Mike" Bridges acting Adjutant General of the Alaskan Department of Military and Veterans Affairs. he spoke on. " Eyes to the West"
After lunch the keynote speaker for the day was Robert Wallace. Bob is the former director of the CIA'S Office of Technical Services. Mr. Wallace spoke on. " Spies who went into the Cold" Here he is being interviewed for the " Project Jukebox". Following Mr. Wallace was Riki Ellison who is chairman and founder of the "Missile Defense Advocacy Alliance Group". After his presentation all Nike vet's were lined up in front of other guest, then all the presenters passed by shook our hands and we were awarded this token. Next we were bussed to Kincaide Park formally Nike Site Point for the presentation " Swords into Plowshares". We were escorted to the park by members of the Anchorage Harley Users Group "HOG". A look from the Balcony of the remolded launcher building at Kincaid Park this one serves as the Headquarters for the park area. Up to the roof area one of our vet's a former MP/Dog Handler is being interviewed by a local TV crew. Site Point was very close to the Anchorage airport this gives you a indication on how close as a plane is on its final approach. This is the second Launcher Building and is were the dedication ceremony was held. As Site Point was a dual site there were 2 other launcher buildings. One of the launcher "roll-up" doors was replaced with this entrance. About to be unveiled 2 story boards and a bronze plaque that will be placed in the park headquarters building. Local High School students were present and awarded each vet a small flower token of appreciation. 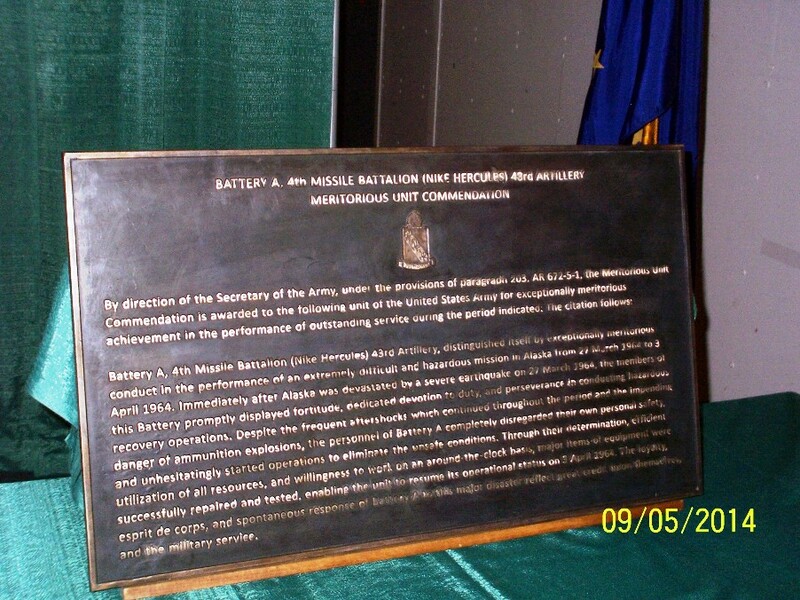 This bronze plaque will be installed telling the story of Site Points efforts after the earthquake, and the unit citation awarded to them as a result of those efforts. To the best of our knowledge this is the only such award ever done during peace time operations. One of the story boards to be displayed. Presently on display is a fin from a Nike missile found in the area. Could be a leftover from the clean-up after the earthquake. 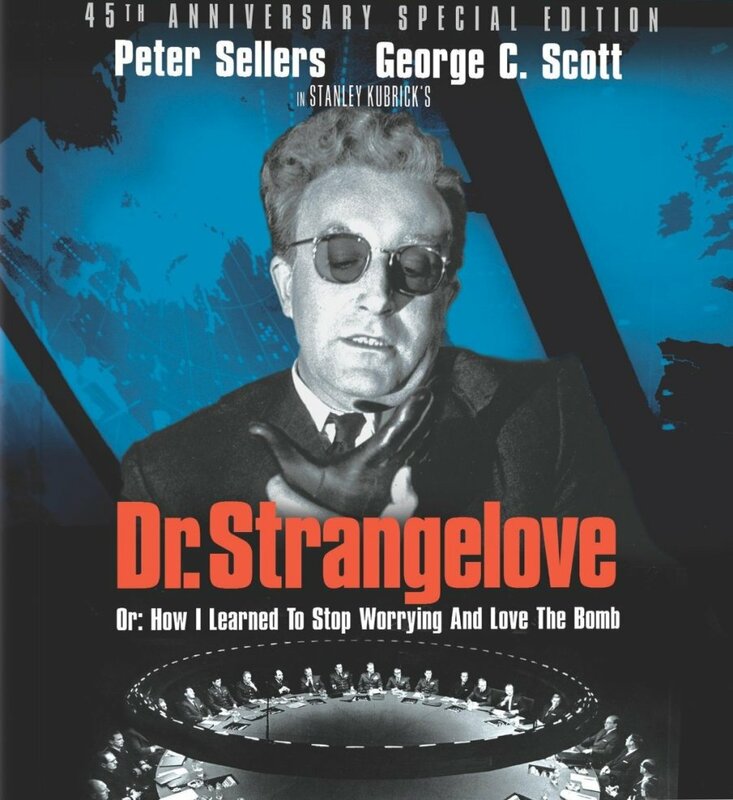 That evening we were invited to a special showing of "Dr. Strangelove" .